Posh striker Jack Marriott slides in to scsore the opening Posh goal against Portsmouth. Photo: Joe Dent/theposh.com. Peterborough United beat Portsmouth 2-1 at the ABAX Stadium tonight (November 21) and manager Grant McCann was delighted with his side’s response to a poor weekend performance. The win secured by striker Jack Marriott’s 13th goal of an outstanding season and an own goal moved Posh up four places to seventh in the League One table and helped erase the memory of Saturday’s disappointing home defeat at the hands of Blackpool. Posh star Marcus Maddison is all smiles after his side's second goal. Photo: Joe Dent/theposh.com. 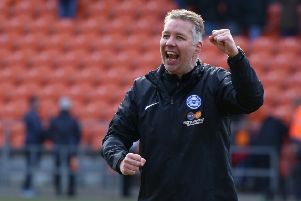 Posh scored both goals in the second-half after a change of formation and saw the game out comfortably despite Portsmouth pulling a goal back 12 minutes from time. “I was pleased with the response to the Blackpool game,” McCann stated. “It was a good positive reaction from a set of players who work hard for this club every day. “The first-half was a bit subdued from both teams. Gwion Edwards should have scored early on after a great pass by Danny Lloyd, but the rest of half passed both teams by. It was like a game of chess with no real tempo. We weren’t moving the ball quickly enough. We had three defenders and two midfielders sitting and everything was happening too slowly. “But we changed shape to a midfield diamond at half-time and it sparked us into life. We pushed Leo Da Silva Lopes and Gwion further forward and worked on getting behind their back four because we felt we would cause them problems with low crosses. Danny Lloyd on the attack for Posh against Portsmouth. Photo: David Lowndes. “And Marcus Maddison delivered two excellent crosses that led to goals. I was delighted for Jack as he’s been beating himself up about missing chances in recent games. “It was a good team performance in the second half and we deserved to win. We defended well and that gave us the platform to push forward. “The important thing now is to build on the win and get a run going. We want to push even higher up the table. Posh are next in League One action at struggling Rochdale on Saturday (November 25), but they will be without Edwards who collected his fifth caution of the season tonight. Central defender Ryan Tafazolli was taken off at half-time tonight, but although he has been struggling with a foot injury that required a pain-killing injection before the Blackpool match, he was removed for tactical reasons this evening.